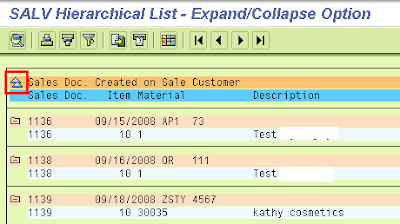 Today in the series of the SALV Hiearchical list display, we will see how to add the Expand/Collapse button in the Hierarchical ALV. All discussion related to the Hierarchical table display can be found under Tutorials > SALV HS Display . Expand/Collapse button will provide an option to users to only see the Header List. By selecting the expand button, it will show both Header and detail List. By selecting the same button again it will collapse the list and gives only the header list. Here is the code Snippet which provides the ADD-ON code. This ADD-ON code can be replaced with the relevent section from this code snippet in the base program. You can find the base program code snippet in the post SALV Hierarchical Table 1 – Simple table display. Adding code to base program is like adding the code correction from the OSS Note. Additionally, we will always include the default PF-status in all the code snippet. Code snippet to get the Expand / Collapse option in Hierarchical ALV. lo_columns TYPE REF TO cl_salv_columns_hierseq. lo_columns = co_hs_alv->get_columns( 1 ). DATA: lo_level TYPE REF TO cl_salv_hierseq_level. lo_level = co_hs_alv->get_level( 1 ).